A pub just off Manchester Square in Marylebone, behind Selfridge's. 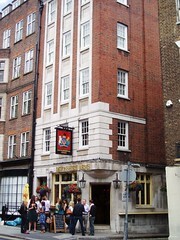 Outside the pub, which has a small and unprepossessing entrance at the corner of a red-brick block, is a small area for smokers with railings and boards for resting glasses on. Inside, the place stretches back fairly far into the building, dominated by wood panelling and pictures of various nobles. Ewan, Kake, and Peter visited on a Wednesday evening in September 2008. Even at 6pm on a weekday, we had no trouble finding a table. The place briefly became noisy with people before settling back to a more relaxed buzz around 7pm. The clientele seemed to be dominated by office workers but there were also a few stray shoppers from Oxford Street. Of the four handpumps at the bar, three appeared to be in use, though the Adnam's Bitter wasn't available as it was still settling. Young's Special (£3.35/pint) and Greene King IPA were on. Other draught taps offered the usual range of lagers as well as Strongbow (£1.73/half). They also had a laminated wine list sitting on the bar, and copies at each table. No sign of food on our visit, but they were doing bar snacks, with a generous portion of large, tasty stone-in green olives costing £2. Last visited by Ewan, Kake and Peter, 3 September 2008. Last edited 2013-05-10 08:26:44 (version 4; diff). List all versions. Page last edited 2013-05-10 08:26:44 (version 4).